The Islamic treatment on Hindu Temples and Shrines in Pakistan. Pak Govt’s Evacuee Trust Property Board are also involved!! The temples of Peshawar fading into oblivion. Attaullah Khan | Apni Awaz Online | Feb 13, 2018:: Bit by bit, the gigantic and tall structures of temples are disappearing from the streets of Peshawar, where only the imprints of a rich heritage could be seen spread out across the city. One of such holiest sites is the Panj Tirath situated on the Grand Trunk Road with the signs of temples with decaying ponds and lawns reminding the glorious past of diversity in the region among various faiths. Today, the holy site presents a sorry tale of neglect with its tempering by giving way to the Sarhad Chamber of Commerce in the 70s. Before the partition of United Bharat, there was no dearth of the temples and holy places across the northwestern parts of Pakistan, especially in Peshawar city. 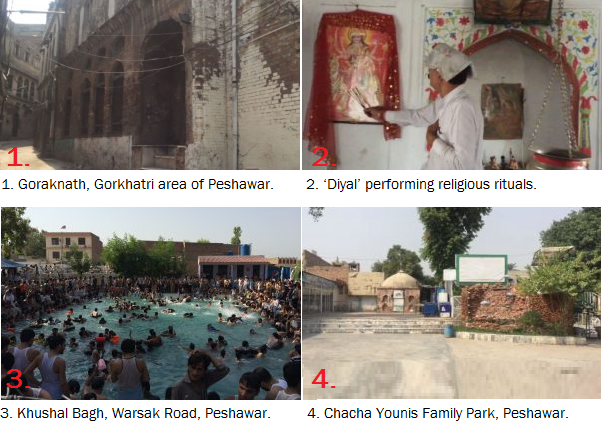 “Five of the most venerated pilgrimage sites, Panj Tirath is present in Peshawar, which is thousands of years old place of yatra for Hindus but it has been converted into Chacha Younis Family Park,” said Haroon Sarab Diyal, a minority rights activist. This is the story of most of the temples situated in Khyber Pakhtunkhwa province bordering Afghanistan. In this article, we will bring to you some of the temples, which have been in the possession of government department or dismantled by the local influential individuals or groups. The Hindus of Pakistan have been waging a struggle for the restoration of temples since partition as 1947 saw a mass migration of minority group to Bharat. According to Pakistan Bureau of Statistics , Hindu community makes 0.03 percent of KP’s total population while Pakistan Hindu Council shows 21033 of total Hindu population. He asserted that the minorities including Hindus have the right to practice their religion and secure their worship places as guaranteed by the Article 20 and 22 of the constitution of Pakistan. The temples have withstood the test of time but it’s difficult to say whether they would continue to exist given their deteriorating condition with every passing day. Presently, these properties are managed by the Evacuee Trust Property Board, which has leased some buildings to government departments. At least half a dozen temples have been taken over by influential individuals or groups who have played havoc with the original structure by converting it into a madrassa or commercial complex, lamented Diyal while talking about the inaction of government over the plight of his community. A survey, conducted by All Pakistan Hindu Rights Movement (PHRM), reveals some shocking stats about the current state of the temples in the country. Out of 428 minorities’ places of worship in the country, 408 have been converted into toy stores, restaurants, government offices and schools after 1990, the survey has found. It had shown that only 20 Hindu temples out of the 428 places of worship are operational. Diyal goes on to share a long list of temples, which have faced a closure or conversion spread over a period of last three decades. Located near Lady Reading Hospital is the Asamai Mandir, which remains closed for the temple goers. It is one of the two historic temples named after the great holy woman. One is in Peshawar, the other is located at the foothills of Koh-i-Asamai in Kabul. “Asamai status is like a “Devi” in our religion but the temple is now being used for a residential purpose for the last three decades to accommodate Kashmiri community in the capital of Khyber Pakhtunkhwa,” said a Hindu activist Diyal in a sombre tone. Today, Government Girls High School, Peshawar Cantonment, stands where a historical Hindu temple once attracted devotees of Hindu faith while another temple in district Bannu, KP, is now a well-known sweet shop and the Holy Shiv Temple in Kohat has also been converted into a government primary school. The fate of Jogiwarha Mandir is not different than other temples in KP, as it has also been turned into a school. Dr. Yahya Ahmad member National Commission for Human Right (NCHR) KP chapter told Apni Awaz that they have received an application regarding a mandir, occupied by the Ministry of Education Khyber Pakhtunkhwa in Risalpur area of Nowshehra, which is set to be converted into a school. The district administration has also caved into the demand for abolishing the Mandir. There is also a Gurdwara alongside the Mandir which has become an Imam Bargah. In Peshawar, a sacred water spring for Hindus at Khushal Bagh has been converted into a swimming pool and the Hindus can neither go there nor can perform any religious rituals. “I will definitely raise this issue in our special human rights court led by the Supreme Court of Pakistan which entertains such cases once a week on Fridays,” the commissioner said. Apni Awaz interviewed Asif Khan, Deputy Administrator Evacuee Trust Property Board, Peshawar to get the official version of the provincial government as he explained that their duty is to utilize trust properties to generate handsome revenue and to serve this purpose they construct commercial plazas, lease it out as per market rates, adding that that 10 to 15 percent of their income is to be consumed on maintenance and renovation of minorities’ worship places. While commenting on a number of functional temples for Hindu Community in Peshawar he could name just a couple of temples, Kali Bharhi Gurdwara and R.A Bazar. The former would be soon inaugurated after renovation while the latter is still disputed between the Sikhs and Hindus of Peshawar. This entry was posted on February 23, 2018 by hinduexistence in Anti-Hindu, Attack upon Hindu Sentiment, Attack upon Hindu Temple, Attack upon Hindu Temple by Muslims, Attack upon Hindus by Muslims, Conspiracy against Hindus, Hindu Minorities in Pakistan, Hindu Persecution in Pakistan, HINDUS IN PAKISTAN, Hindus under Attack, Hindus under Islamic Aggression, Islamic Conspiracy against Hindus, Islamic Menace, Jihad in Pakistan, Muslim Conspiracy Against Hindus, Pakistani Menace against Hindus, Persecuted Hindus, Save Hindu Minorities in Pakistan, Save Pakistani Hindus and tagged All Pakistan Hindu Rights Movement (PHRM), Evacuee Trust Property Board, Islamic treatment on Hindu Temples in Pakistan, Pakistan Evacuee Trust Property Board, Pakistan Hindu Council, Temples of Peshawar fading into oblivion, The vanishing Hindu Temples in Pakistan's Peshawar.